You can make any size wood picture frame that you want. The one I have pictured here is 5 1/2 X 5 1/2 inches. You can use anything to decorate them including dried flowers, silk flowers,scrapebook paper or anything that fits the occasion. You can make a collage of different size frames using different flowers or what ever you want on them. They look very nice on the wall especially in a baby's room. I made my own wood block picture frame but you can buy them at craft stores or maybe you know someone who can cut one for you. You need to drill two holes in the top for your ribbon. Choose a ribbon that compliments your frame color. Paint your picture frame to match your dÃ©cor. You will probably need to give it two coats of paint for a good coverage. I use a matte finish but you can use a gloss finish if that is what you like. I personally think that a gloss takes away from the finished product. Glue your picture on with a tacky glue or else you can use glue dots that all craft stores have. They are very handy to use and they really stick (besides they are really cheep). After you have your picture placed on the picture frame you are ready to decorate it. You can use dried flowers, buttons, silk flowers or even decals. You can also paint your own flowers on the frame using free hand or stencils. 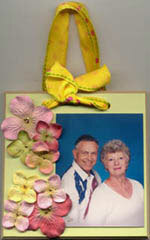 For the picture frame shown here I used silk flowers attached with glue dots. Then I put a small gem in the middle of each flower. Thread your ribbon through the holes and tie a bow. Your own wood picture frame is now done and ready to hang. Wasnâ€™t that easy! !